A continuing subsistence practice is to gather cotton grass roots and below-ground parts of the stems for food. 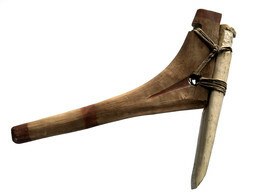 Walrus tusk root picks like this one were traditionally used to dig them up. Voles (small tundra rodents) also harvest the roots and store them in their burrows as a winter food supply. In fall, people probe grassy mounds to find and raid stores of this “mouse food.” It can be eaten raw or added to akutaq, or “Eskimo ice cream” made of sugar, fat, berries, whitefish, and other ingredients. The roots are also cooked with seal meat or tomcod livers.